Next AASLD Liver Meeting Underway this Week In D.C. 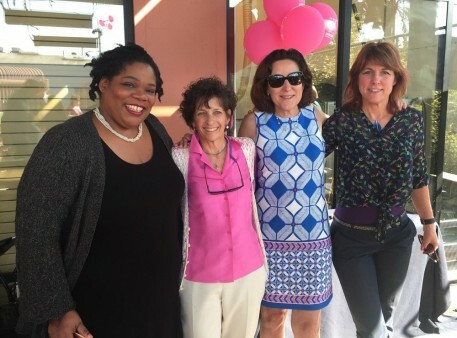 In recognition of Breast Cancer Awareness Month, HairToStay hosted a fundraiser at Charles Chocolates on Sunday, October 15. Though the event was dubbed “Chillin’ with Charles,” the rare warm San Francisco sun put the gourmet chocolates at risk of melting. Bethany Hornthal founded HairToStay to provide subsidies for scalp cooling to prevent hair loss during cancer treatment. Automated systems like Dignitana’s DigniCap replace older manual cooling caps that must be kept in a freezer and switched out frequently during therapy. Paxman also makes an automated scalp cooling system. Last year only around 30 medical centers in the United States offered automated scalp cooling and it was FDA-approved only for breast cancer, Hornthal said. Today scalp cooling is available at over 100 centers and it is approved for people with any type of solid tumor. However, it is still seldom covered by insurance. Since 2015, HairToStay has given subsidies to more than 500 people. But this is just the tip of the iceberg. Horthal aims to offer $1,000 subsidies to 1,000 people in the next year, partnering with hair salons from coast to coast to raise both money and awareness—a true “hair roots” movement. Dr. Hope Rugo, director of breast oncology clinical trials at the University of California, San Francisco, spearheaded the studies that led to the approval of scalp cooling in the United States. Among the 1 in 8 women in the U.S. who will get breast cancer—with about a quarter million diagnosed each year—at least half will undergo chemotherapy that causes hair loss 100 percent of the time, Rugo said. What’s more, some of the drugs have a long-term effect on the hair follicles, making hair regrowth slow and sparse. Traditional chemotherapy kills not only cancer cells but also fast-growing cells throughout the body, including those in the hair follicles, Rugo explained. Scalp cooling works by circulating a coolant through tubes in the cap, maintaining a consistent cold temperature that constricts blood vessels in the scalp and reduces the metabolism of hair follicles, making them less sensitive to the drugs. The highlight of the afternoon was testimonies from two women who received HairToStay funding to use automated scalp cooling during treatment. Stephanie Wells, a professor and breast cancer survivor, said she didn’t want her students to be reminded that she had cancer every time they looked at her with a bald head. 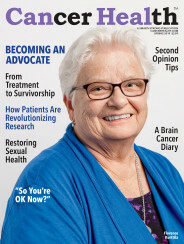 We look forward to profiling these women, Dr. Rugo’s team, and HairtoStay in an upcoming issue of Cancer Health.